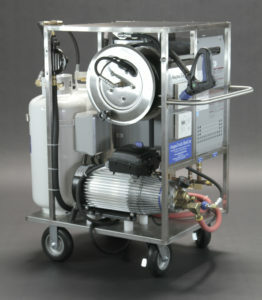 AaquaTools AaquaSteam-n-Vac high pressure surface steam cleaner and recovery system is our newest innovation. It is possible to clean walls and other surfaces with steam and keep them dry. Save time! Steam cleaning is a great way to disinfect, sterilize or degrease surfaces. By using this cleaner you are able to clean 4-5 times quicker than by using a wand. Wineries, driveways, drive-thrus, patios, garages, sidewalks, school yards, factory & warehouse, restrooms, food processing, service stations, parking lots, pool decks, sport courts, roofs & decks, loading docks, tile, stadiums, marina docks.